After presenting you with the tools to develop your Differentiating Strategy and Unifying Business Idea, we’ll turn our focus to creating real differentiation in your business. This means, going beyond what you hope to be…and just peppering your marketing and sales materials with “the new strategy.” This means aligning your entire organization; your policies, practices, products, services, hiring, pricing AND your communications to your new Unifying Business Idea. The stories we share show the payoff. This article is part three of a three part series dedicated to thinking strategically and creatively about your business. In part one, I challenged you to answer the question; How Unique is Your Business? I then went on to describe a tool/process to create a Differentiating Strategy for your company. 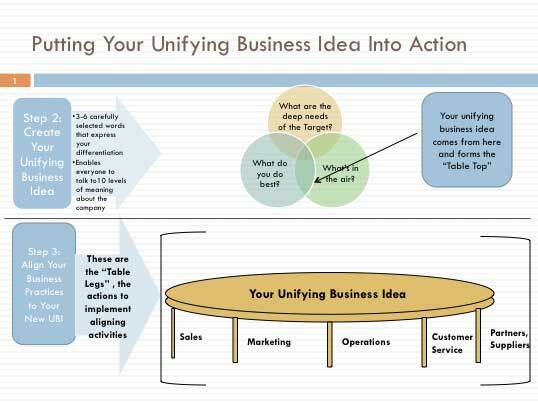 Article number two offered help on: How to Stand Apart from Your Competitors by Defining Your Unifying Business Idea. Today, let’s talk about creating real differentiation in your business. This means, going beyond the step of defining what you hope to be…and just peppering your marketing and sales materials with “the new strategy.” This means aligning your entire organization; your policies, practices, products, services, hiring, pricing AND your communications to your new Unifying Business Idea. A common mistake I often see being made is that company executives will do the work to define a new Differentiating Strategy and Unifying Business Idea. But then, they don’t continue on to make the changes inside the company to align everything they do to support the new direction. So inevitably, they will lose credibility with customers, employees and suppliers. The chart below visualizes this important step; the metaphor of the table top and table legs is appropriate. Your Unifying Business Idea will fall flat, unless it is supported by actions that deliver on your promise. Let’s take a look at some tangible actions companies have taken to align their business practices with their Unifying Business Idea. We’ll look at some of the key functional areas of the business that are crucial to align. Aligning the Sales Function at The Document Company, Xerox. When Xerox became “The Document Company” some twenty years ago, it gave them permission to shift the sales conversation from products and technology -- the “gear” they sold -- to talking about the “product of the product”, or documents. Inevitably, it put Xerox closer to customers’ needs; the sales conversations revolved around what people were using Xerox machines to produce. This, by the way, was a customer’s entire work product! We were no longer talking about 75 pages a minute and duty cycles, but we were talking about customer communications…financial reports…sales presentations…everything a customer did to run their business. Document analyses flourished, and arguments shifted from TCO to document quality, supporting key work processes and work teams. And, it opened the door to explosive growth at Xerox Business Services – the company’s outsourcing division. No longer was it solely equipment that people focused on, in sales conversations. They just wanted their documents to be produced when and where they needed them, conveniently and effortlessly. A bank is a bank is a bank, right? They all sell the same products and services. The variations in strategy are often so subtle, we can’t really justify making a change. But then there is TD Bank, with a UBI suggesting they are America’s Most Convenient Bank. And they deliver on it in many small and subtle ways. The most visible proof is the fact they are open seven days a week (yes, even Sundays until 4pm) and every holiday except Thanksgiving, Christmas, New Years Day and Easter. They also stay open Thursday and Friday evenings until 8pm. So for families with two working parents, this can be very helpful. Also, they call their branches “stores”; and they have the Penny Arcade, where you can get your coins counted free of charge (kids love it). They freely give away free pens to any customer who stops in; how many banking transactions can you do inside a branch without a pen? So they provide one, each and every time, encouraging you to “keep the pen”. So when you visit a TD Bank store, they reinforce just how convenient they are. Apple is arguably the best marketer in the history of the technology business. With a Unifying Business Idea that encouraged people to “Think Different”, they’ve captured a spirit and a loyalty that is unrivaled in the high-tech space. Certainly their innovative products and their business model breakthroughs like iTunes and the App Store are evidence enough. And their outward communications continue to reinforce their innovative culture. Take a look at this television ad from a few years back: http://www.youtube.com/watch?v=USn5t5nQWU8. With the visual footage of famous, alternative thinkers, the copy reads: “Here’s to the crazy ones, the misfits, the rebels, the trouble makers…” (as it flashes images of Albert Einstein, Bob Dylan, Martin Luther King). “The round pegs in the square holes…” (more images of Richard Branson, John Lennon, Muhammad Ali, Ted Turner, Alfred Hitchcock, Amelia Earhart). By associating with all these iconic champions of change and risk-taking, they cement their UBI. And the closing line, seals the deal: “Because the people who are crazy enough to think they can change the world…are the ones who do”. This would be wild overstatement for any other company other than Apple; but what they DO, allows us to believe that they indeed, Think Different. Aligning Customer Service at Amazon; The Earth’s Most Consumer Centric Company. Now with sales exceeding $22 Billion annually and growing 27% a year, innovations that benefit their customers include: One click check out; customer written book reviews; the Recommender System; “search inside this book” and much, much more. Having a stated UBI is not enough. Living it…aligning to it…and governing by it will help you capture the success and differentiation you envisioned.